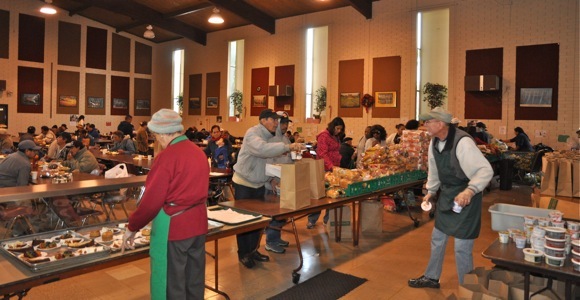 The line of politely waiting patrons was already dozens deep when stopped by St. Anthony’s Padua Dining Room last week. Also waiting were two of the non-profit organization’s volunteers, Bob Dehn and Patricia Papalian (pictured above). on hand to give a tour of the festively decorated dining room and gleaming kitchen. The Dining Room began serving low-income elderly a weekend meal supplement in 1974. It’s now a six-day-a-week (Mon-Sat) year round operation serving up to 600 hot midday meals. The three big meals of the year are Thanksgiving , Christmas and Easter. 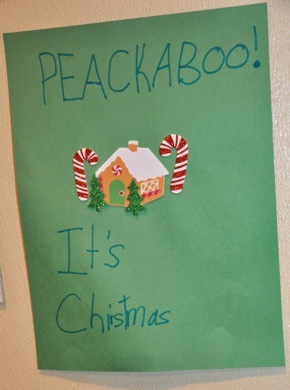 A holiday wish list for both food and clothing is posted on the organization’s website. If you’re interested in volunteering, call (650) 365-9665. In addition to Christmas dinner from noon to 2:00 pm, St. Anthony’s hosts a toy giveaway on Christmas Eve starting at 7:00 am. Children two to 14 are given the opportunity to pick out one unwrapped toy. People interested in donating toys – or food and clothing – should drop them by St. Anthony’s, which is located at 3500 Middlefield Rd., Menlo Park. The organization also welcomes your donation of cash by either check or credit card.